The itinerary of our Mary Queen of Scots tour included a visit to the Palace of Holyroodhouse and I looked forward to this with great anticipation. 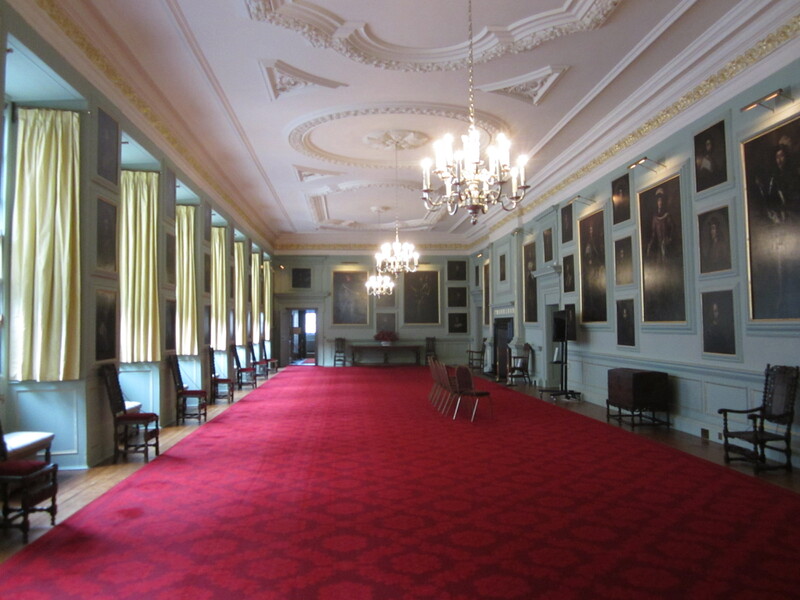 Since learning the Palace was the scene of the murder of David Rizzio, personal secretary of Queen Mary, I have wanted to see the room where it happened. 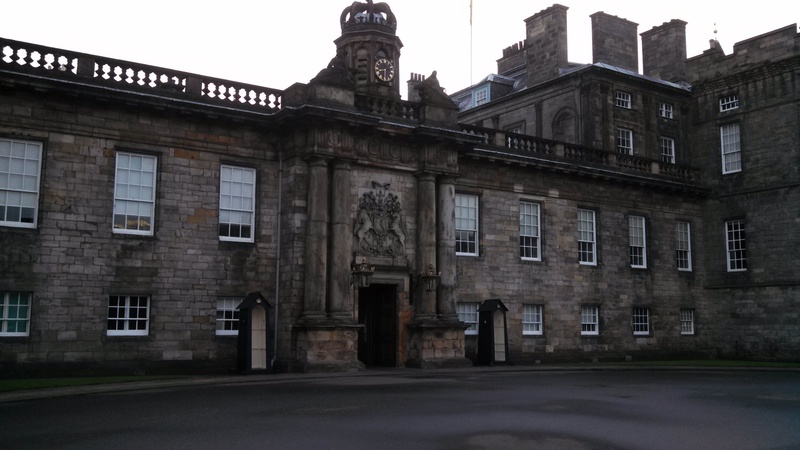 I was not disappointed and seeing Holyroodhouse was one of the highlights of my trip. The origins of the Royal Palace of Holyroodhouse date back to the founding of an Augustinian abbey in the twelfth century on forested land below the volcanic peak called Arthur’s Seat. It sits at the end of the Royal Mile in Edinburgh and for centuries it has had royal connections and has gone through several transformations. It is still a working palace to this day. The name of Holy Rood can be attributed to a legend concerning King David I, son of King Malcolm Canmore and his saintly wife, Queen Margaret. According to the tale, King David was hunting a stag in the wooded forest when he was thrown from his horse and attacked by the stag. As he was fighting with the animal, David saw a vision of the holy cross either between the antlers of the stag or in a silver cloud in the sky. This vision saved him from the attack and in honor of his deliverance, he founded a monastery in 1128. It is also possible the name of the monastery derived from a fragment of the “true cross” which Queen Margaret brought with her to Scotland. The initial church was very small and the community soon outgrew it. Construction of a new church lasted from 1195 to 1230 and it became a large, spacious abbey including cloisters, a chapter house, refectory and guest houses. The new foundation, from its earliest days, contained lodgings for the reigning monarch, at first in the abbey itself and later in separate special accommodations. These royal lodgings eventually surpassed those of the Abbey in substance. The Parliament of Scotland met in the Abbey several times in the thirteenth, fourteenth and early fifteenth centuries. In 1437, after the murder of King James I in the capital of Perth, Edinburgh became the national capital of Scotland. By this time, the kings preferred to live in Holyrood rather than Edinburgh Castle. Holyrood had beautiful gardens, a large deer park and was less exposed than the castle of Edinburgh on its high volcanic rock. King James II was born at Holyrood in 1430 and crowned there in 1437. He also married Mary of Guelders there in 1449 and was buried there. 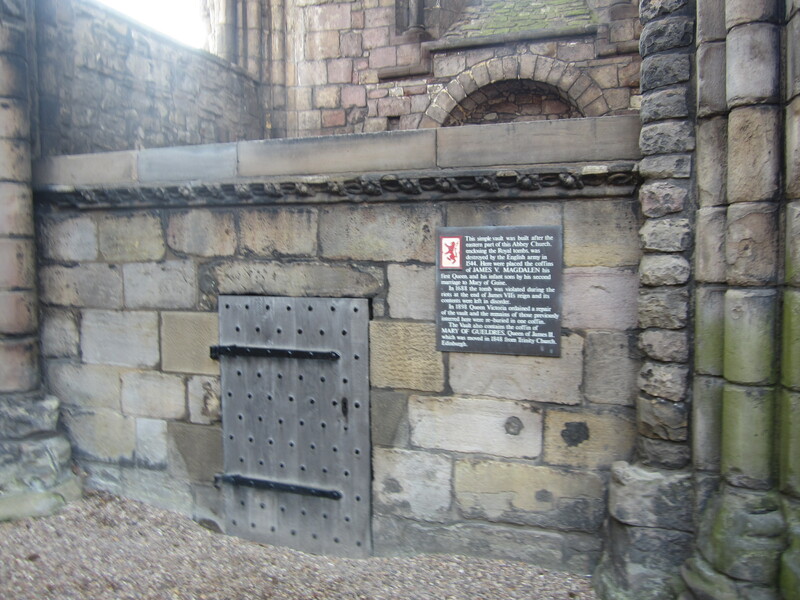 Mary of Guelders was initially buried in the Trinity College Kirk but her remains were later moved to Holyrood Abbey. King James III married Margaret of Denmark in the Abbey in 1469. The idea for royal palace next to the Abbey came from James IV. Before his marriage to Margaret Tudor was celebrated in the Abbey in 1503, he cleared the grounds adjacent to the abbey cloister and between 1498 and 1501 built a palace. Three days of tournaments were held at the new palace after the wedding and Margaret would be crowned in the Abbey in 1504. Only a fragment of the gatehouse of this palace is left today. The most extensive palace construction took place during the reign of James V. He intended to build a Renaissance palace like those he had seen in France and hired French architects and craftsmen. In 1528 a new massive tower structure with rounded corners was built at the north-west corner of James IV’s palace. This was meant to be a residential area of the palace but it also served a defensive purpose. It is known as the James V Tower and is the oldest part of the palace of today. The west front of the palace was also rebuilt with a more domestic purpose including reception rooms, a double-towered gateway, battlemented parapets, ornamental crestings and glazed windows. There was also a new chapel and the old chapel became council chambers. Most of this work was most likely done in anticipation of James’ marriage to the French princess Madeleine of Valois in 1537. Madeleine unfortunately died at Holyroodhouse a little over a month after her arrival in Scotland. She was buried in the Abbey. James married another Frenchwoman, Marie de Guise in 1538 and she would be crowned in Holyrood Abbey in 1540. Marie had patterned gardens built at Holyroodhouse modeled after the gardens she knew in France such as those at St. Germain, Fontainebleau, Amboise and Blois. James and Marie’s daughter, Mary was born in 1542 at Linlithgow Palace and succeeded to the throne six days later after the death of her father. James V was buried in the Abbey. The Abbey and the Palace suffered extensive damage in 1544 and 1547 during the Rough Wooing by the English in the reign of King Henry VIII of England and again during the Scottish Reformation in 1559. After the Reformation, abbeys became redundant and a good portion of the buildings were torn down, leaving only the nave. In 1548, Mary was sent to France to be brought up at court before her marriage to the French Dauphin Francois in 1558. She would become Queen of France in July of 1559 but her husband died in December of 1560. Mary’s mother, who had been her regent in Scotland while she lived in France, had died in June of 1560. Mary decided to return to Scotland to rule in person in 1561. Mary had never visited Holyroodhouse before she left for France and the palace had been empty since the death of her mother. She moved into the apartments on the second floor of King James’ tower. Mary brought with her two hundred and forty books to replace the library at Holyroodhouse which had been destroyed by the English. After Mary’s return from France, she danced nearly every night at the Palace with her waiting women, the four Marie’s, sometimes until well after midnight. Mary had permission to practice her Catholic religion in the royal chapel. She met with her privy council and a lavish, extravagant masque was held at the Palace in February of 1564. On July 29, 1565, Mary and Henry Stuart, Lord Darnley were married in the private chapel at Holyroodhouse. Four days of celebration followed and after their honeymoon, they returned to the Palace. Darnley was assigned the rooms below Mary’s which were connected by a staircase. In March of 1566, some of the Scottish lords, along with Mary’s husband Darnley, climbed up that same staircase and murdered her personal secretary David Rizzio in her chambers, stabbing him to death in what must have been a terrifying scene. Later Mary and Darnley escaped Holyroodhouse, leaving by a subterranean tunnel leading off a wine cellar. Mary gave birth to her son James a few months later in Edinburgh Castle. In February of 1567, Darnley was murdered in mysterious circumstances. In May of that same year, Mary raised the Earl of Bothwell high enough in the peerage (Duke of Orkney and Lord of Shetland) to marry him. The wedding took place on May 15, 1567 at Holyrood with Protestant rites. Bothwell and his servants moved into Darnley’s apartments. The marriage was condemned by the Scottish lords. Eventually Mary was taken captive by the lords and held in Holyroodhouse before being taken to Loch Leven Castle and forced to abdicate. Both Mary and Bothwell’s apartments were looted afterward and her clothes and jewels were taken. Papers were found and among them there supposedly was a letter from Mary to Bothwell acknowledging that she knew of the plans to murder Darnley. Mary escaped from Loch Leven and made her way across the border to England where she was held in genteel captivity by Queen Elizabeth I for twenty years. She was found guilty of plotting the death of Elizabeth and putting herself on the English throne and was beheaded at Fotheringhay Castle on February 9, 1587. Mary had abdicated in favor of her infant son James. In 1579, James abandoned his schoolroom at Stirling Castle and moved into Holyroodhouse. He began extensive repairs of the palace and enlarged the gardens. By the time his queen, Anne of Denmark was crowned at Holyrood Abbey in 1590, James had established a large court and his household numbered six hundred people. 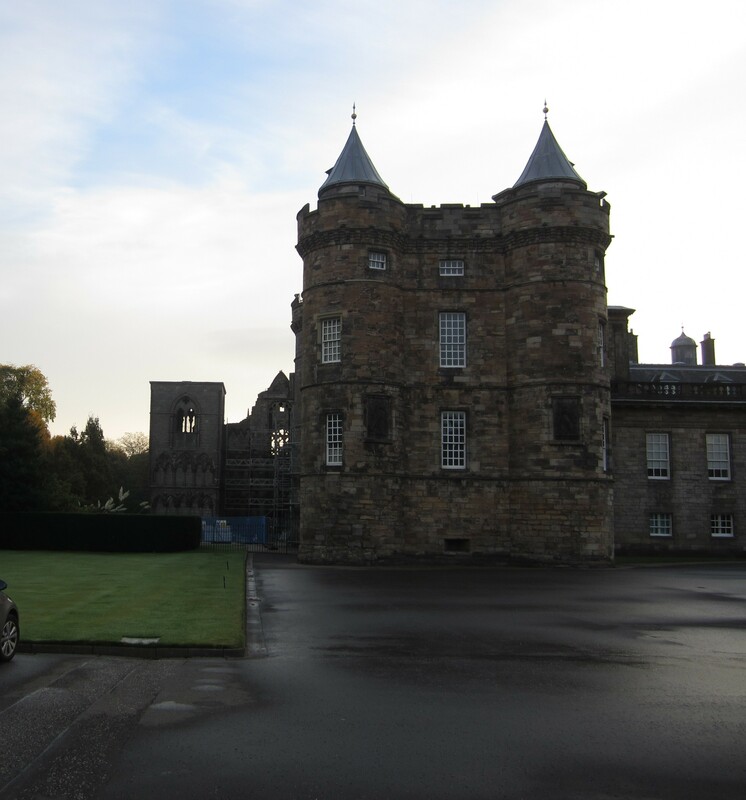 James’ son, the future King Charles I, was baptized at Holyroodhouse on December 23, 1600. In 1603, after the death of Queen Elizabeth I, James became King of England. He was delighted and on April 5, he left the palace of Holyroodhouse to the sound of cannons and moved to London. Holyroodhouse fell into neglect. Some repairs were done in 1617 when James returned to Scotland for a visit. Both the Palace and the Abbey were renovated in 1633 when the Scottish coronation of James’ son Charles I was performed in the Abbey. The religious inflexibility of Charles along with other issues caused civil war and turmoil leading to Charles’ execution in 1649. The Protectorate, under the leadership of Oliver Cromwell, came north to impose the authority of Parliament over Scotland. Cromwell and his troops had a victory at the Battle of Dunbar and Holyroodhouse was occupied as a barracks. There was extensive fire damage to the Palace. Charles’ eldest son, Charles II, was crowned in Scotland in 1651 and restored to the throne of England in 1660 and Holyroodhouse was once again a royal palace. The Scottish Privy Council held regular meetings at the Palace and in 1671, King Charles began extensive renovations. Charles took a keen interest in the design and kept it simple to save costs. A new tower was built on the north-west corner to balance out the façade with King James V’s tower. The towers were connected with a two story façade with a main entrance. The quadrangle of rooms were arranged around a courtyard and had beautiful baroque interiors. These renovations were done by 1674 but King Charles never actually saw the finished product. One of the highlights of Charles’ design was the Great Gallery. He commissioned a series of one hundred eleven portraits of real and legendary Scottish kings from the earliest all the way down to the Stuarts in a type of reassertion of the Stuart succession to the throne. 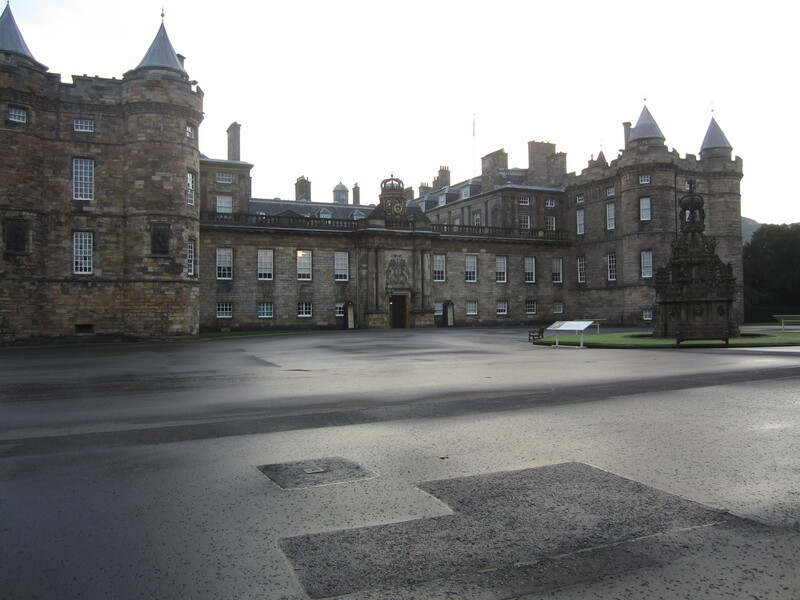 Charles’ successor, his brother James II & VII did live at Holyroodhouse with his wife Mary of Modena for a short time. After the Union of the Parliaments in 1707, the Palace provided grace-and-favor apartments for certain Scottish noblemen and fell into neglect. In 1745, the Young Pretender, Prince Charles Edward Stuart, also known as Bonnie Prince Charlie, lived and held court at Holyroodhouse in an attempt to regain the throne for his father King James II & VII. The Duke of Cumberland brought Hanovarian troops from England and suppressed the Jacobean Rebellion. 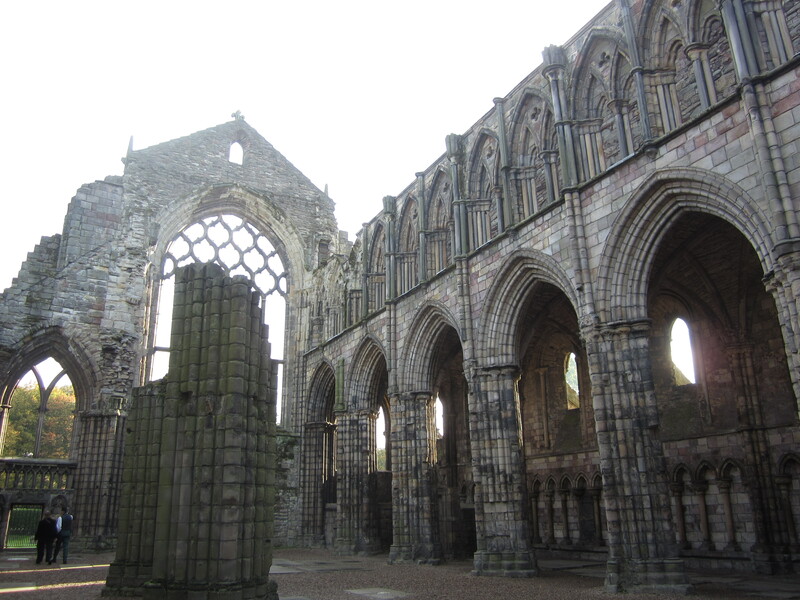 Restoration work would be done on the nave of the Abbey, including a new roof in 1758. This would collapse ten years later, was never repaired and the eventually the Abbey fell into the ruins we see today. There were no further renovations on the Palace until George IV’s state visit to Scotland in 1822. He ordered that the apartments of Mary Queen of Scots were to be preserved and sacred from any alterations. After Queen Victoria purchased Balmoral Castle, she reinstituted the tradition of staying at Holyroodhouse and this inspired the Scottish people to begin a massive program of renovations. In the twentieth century, King George V and Queen Mary considered the Palace a family home and did more improvements including bathrooms, electricity and elevators. They also began a tradition of staging garden parties. The current Queen Elizabeth II visits Scotland annually and stays at Holyroodhouse. On our tour of the Palace, we got to visit rooms where the Queen lives and works. The Great Gallery with all the imaginary portraits of Scottish kings was spectacular. But the best part of the tour was the James V Tower with the rooms where Darnley and Mary Queen of Scots slept and lived and where the terrible Rizzo murder happened. This Palace presents the essence of Scottish history all in one place. In 2004 I was in Edinburgh for the first and only time. On the day before leaving Scotland I rushed down the Royal Mile to Holyrood, so excited to finally see Mary’s rooms and the place where David Rizzio was murdered! The gates were closed and the guard said; “Sorry, ladies, HRH Prince Charles is holding a meeting here today. It’s closed to visitors”. I said “how can he do this to me. I’ve dreamed of being here”. Thank you to The Freelance History Writer for this post! A very complete account of this fabulously historical place! When I can associate people with places where they lived, I understand the ins and outs of history much better. I visited about 5 years ago. 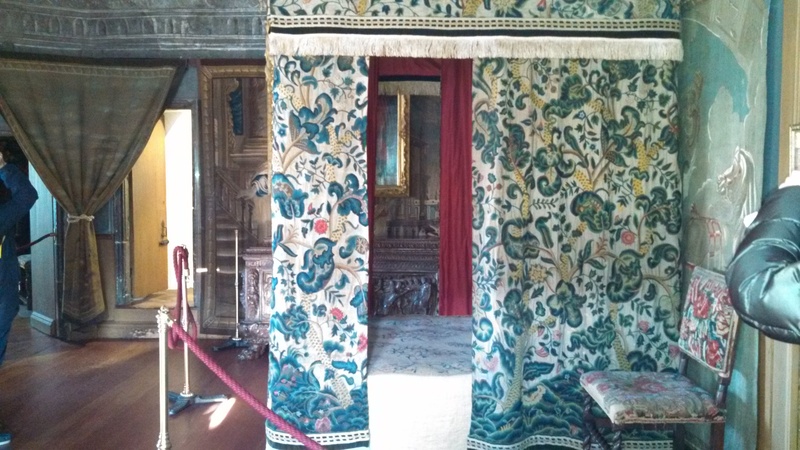 The rooms of Mary Queen of Scots were my favorites too. And now the very modern Parliament building is right across the street, if I remember correctly. Holyroodhouse is truly living history! I always leave here a more educated person. 🙂 Thank you! Thank you so much Susan for a wonderful article. Holyrood Palace was cl used when we were in Scotland in 1989. It was a great disappointment to me not to be able to visit. Your article is so complete as to dates and history, it somewhat makes up for me not being able to be there. Your whole tour was wonderful for you. You’re welcome Kalli. Such a shame you couldn’t visit. And yes I loved that tour. I was in history heaven! Wow, Susan! I am envious as I haven’t yet made it to Holyrood Palace, despite it being quite close! What a time capsule of Scottish history – so much happened here. I didn’t realise that James V and his wife (and James II) were buried in the Abbey. It sounds like a fantastic experience to walk around the rooms of Mary Queen of Scots. Imagine the balls she held, and the jousting tournament that lasted 3 days after the marriage of James IV! I know Jo! The whole palace and abbey just ooze Scottish history. I think that’s why I liked it so much. I was surprised to find that Mary of Guelders was in the vault. You must go and spend all day!